In the Spotlight…”The FAMOUS Matching Couple,” Mel & Joey Schwanke! 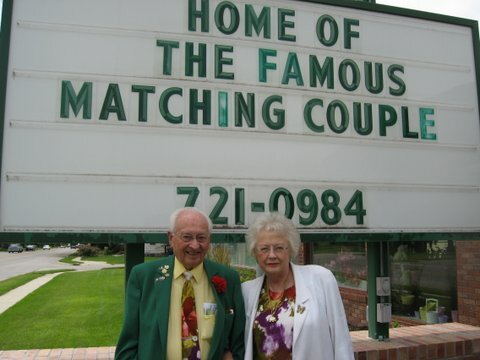 The Famous Matching Couple….like you’ve never seen them before! Mel & Joey have been seen and interviewed by many local & national news stations (including the TODAY show, Good Morning America, LIVE with Kelly, the Huffington Post and The Daily Mail UK)…and have been quite busy enjoying their new found “fame.” The interviews have been fun and light hearted with Mel & Joey showing off some of the outfits from their “famous matching collection” and sharing a few of the secrets of their long & happy marriage. But, here at uBloom, we wanted to dig a little deeper to get Mel & Joey’s ‘back story’ and find out the details of what makes them successful in life, in flowers and in marriage! True to our interview style, we asked the questions everybody wants to know the answers to…and snagged the ‘in-depth’ details you will find at NO other source! 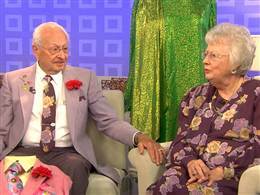 Because our interview covers a wide time span extending into the personal & public life of “the Famous Matching Couple,” we have broken our interview down into 3 separate interview parts. 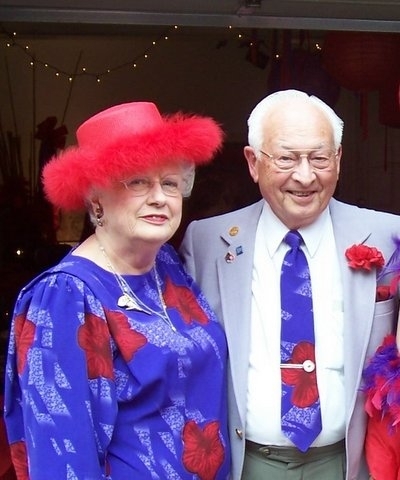 Today, we are posting ‘part 1′ of our interview with Mel & Joey Schwanke…”The Famous Matching Couple on…Being in the Flower Business.” Joey shares so many interesting facts about how florists & greenhouses were run “back in the day.” You are going to love reading about her family history and the development of the floral industry through the years. So, grab a cup of “joe,” relax and enjoy our Spotlight interview with Mel & Joey Schwanke! Mel & Joey are enjoying their new Fame! 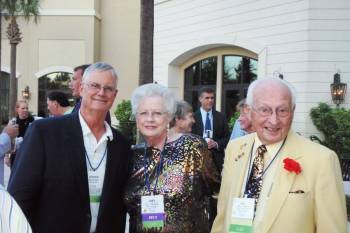 Mel & Joey…you are ICONS in the flower world…and you have a tremendous family history in the industry spanning multiple generations. 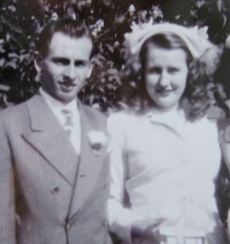 When & where did your family’s flower journey begin and how did the business get started? The family journey began in 1896 with my grandfather Charles H. Green, who had originally lived in Iowa and worked in a greenhouse. Later, he came to Omaha and worked in another greenhouse, but he always hankered to own his own greenhouse. He was a professional palm plant grower with some years of experience. He read an ad in the newspaper advertising a small greenhouse operation in Fremont for sale. It was a small greenhouse of several hundred square feet of glass, heated by a small tractor engine steam boiler. There also was a two story house on the property with several acres of land. On April 6,1896, he took a train to Fremont and was successful in purchasing the property. 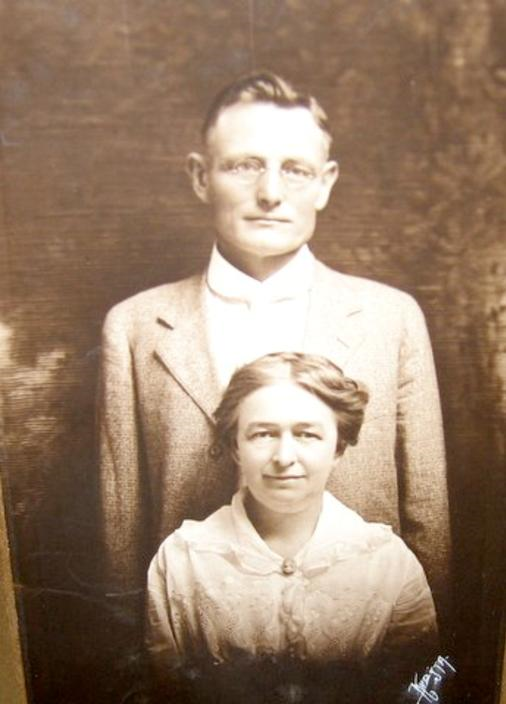 In the Fall of the same year he met a young teacher Katherine Rogers, and on October 6, 1897 they were married. 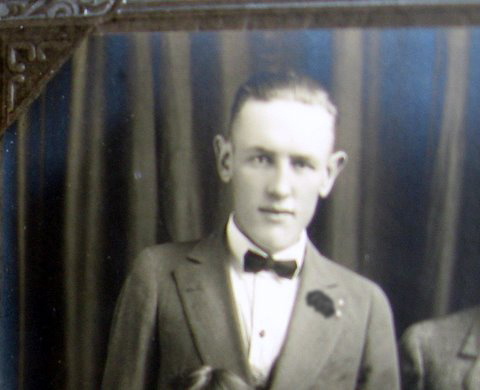 On Thanksgiving Day 1900 his second son, my father, was born. The house had been completely remodeled by 1904. It was extensive remodeling, taking the back of the house and putting it in front, and the front of the house to the back and raised the middle to complete the second story. It is still there today and the fourth generation still lives there. We, the third generation, lived there 35 years and did more remodeling. It is the oldest home in Fremont still occupied by the same family. The greenhouse head house was just 20 feet from the back door of the family home across a driveway. They added a large barn for the family cow, the delivery horses, and one plow horse. There was a chicken house and fenced yard as well. Spanning several generations, your family’s flower business has transitioned from one family member to the next. Tell us about the history of your family’s shop, Green’s Florist, and discuss a little bit about how it progressed as each generation took over. My Grandfather took on a couple of partners and then he expanded the greenhouse to grow primarily roses. He added 3 or 4 smaller houses later. Three were for growing carnations. He liked to grow freesias along the edges of those benches once a year. One house in the middle had ground benches for sweet peas, calla lilies, a lily pond, and some shorter benches for potted plants. One house had a long bench devoted to English violets. Also, one house was all Palm Plants on the ground and ferns grown along the ceiling hanging from the pipes. In the years to follow, he built two more houses on the west end for chrysanthemums, bench and later added potted. By 1916, the greenhouses totaled 40,000 square feet of glass. Most of his first crops in the greenhouses were for cut flowers, but he started lots of plants for spring flower beds and outdoor crops. In 1904 and 1910, new coal fired boilers were installed for heat. These were hand fired, requiring shovels of coal every 20 to 30 minutes night and day. In the spring and fall, a night man was hired for that job, as we burned 700 tons of coal in the average year. Grandma was also known to start baby chicks and ducks in the greenhouses in the Spring. Somewhere along the lines Grandpa let the partners go, bought them out. By this time the hand pumps had been replaced with a large wooden water tank and windmill. They had built a large 3 story barn for storage and hay for the family cow, two delivery horses, and a riding horse. Horse and Buggy delivery was the mode until 1915 when he bought his first Model-T delivery truck. My dad was the first kid in school to have a car, as he needed to get home from school and do the delivery. He also bragged that with the top down it held 17 kids comfortably in the box and around the perimeter of the roadster. Few arrangements were designed back then as we know them today. They were boxes of flowers and hand bouquets. For funerals there were many set designs: Gates ajar, Broken Wheel, and Vacant Chair for families, and Casket Sprays, and the Faith Hope and Charity emblems for the Odd Fellows organization, as well as Eastern Star, and Square and Compass for the Masons. During the years of the great flu epidemic, it was not unusual to have 24 funerals in one day and it was necessary to limit how many pieces could be sold for each one to be sure there were plenty of flowers to go around. 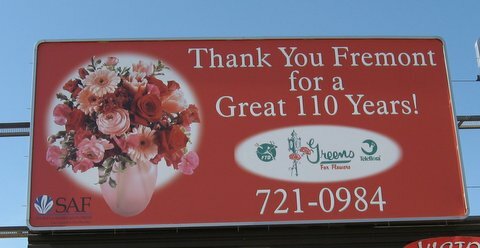 We had three downtown locations Greens Greenhouses joined Florists Transworld Delivery (FTD) in 1916 and belonged for 90 years. Carnation Joe Green (my dad) started wearing a fresh red carnation every day in 1916. He was adamant about it and never went without. Even in a string T Shirt on the tractor, or plowing with horse and plow, to attending meetings, to taping one on his chest when swimming. He was also an avid boater and built a big mahogany boat in the greenhouse that was so big they had to tear out part of the glass to get it out. It was magnificent! 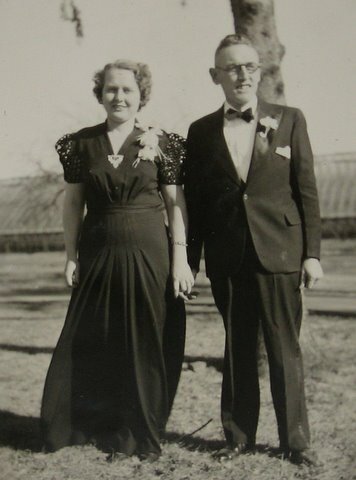 Dad became business manager in 1921 and later that year married a telephone operator named Lily Evelyn Olson on March 4th, just 3 days before her 21st birthday. They had met the night President Harding’s funeral train came through Fremont, well past the scheduled time, of midnight. 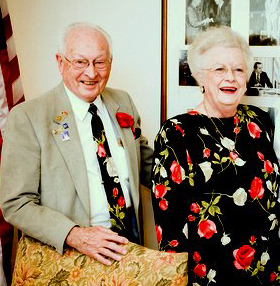 After their marriage, Joe bragged that he wore a carnation all day and slept every night with his Lily. They had three daughters, Roslyn, Alyce Mae, and Jo Ellen. The first daughter married a Dentist, the second, a Welder, so Joe was determined the Jo Ellen (Joey) would bring a great man to work in the greenhouse. What was it like growing up in a flower nursery and shop? Growing up in the greenhouses was a delightful experience. I put out a fire in the greenhouses at the age of 3. Daddy was using a flame-thrower to burn weeds under the benches and accidently got too close to the wooden back door of the last house. I went down the aisle and told daddy the door was on fire and he asked if I thought I could put it out and I said “yes.” I took my baby water can and trotted back and forth to the sink…dad could see my little blond head going back and forth, so he brought a hose up to me and turned on the water faucet and let me put the fire out. I was lucky to be born in a greenhouse setting and to grow up with the growing of flowers. It is something not a huge amount of people get to do anymore. Greenhouses are not nearly as prevalent as they were when I was growing up and when Mel and I were first married. 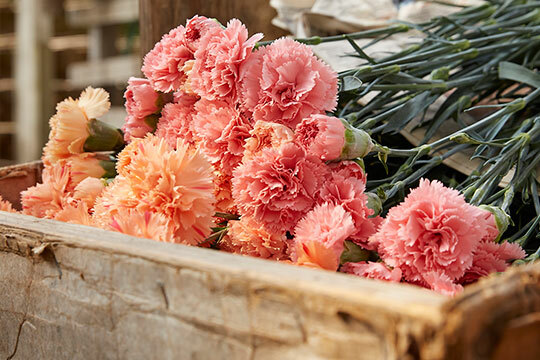 We would travel to Colorado where there were hundreds of carnation growers. We had friends in Florida with huge green plant operations. We would travel to Minnesota, Iowa, and Kansas to visit greenhouses… and even in Omaha we had several fellow greenhouse operations. Most of them were family operated and they were friends of my grandparents…then their kids were friends with my parents…and then their kids were friends of ours. We were generation after generation of flower and plant growers. I miss that today. Most of the folks that were “our generation” were just 10 years older than Mel and I and now that Mel and I are 82 and 87 those folks are all gone. All that is left are the memories. What is your fondest childhood memory(s) of being in the flower shop? My younger sister and I played a lot in the greenhouses, especially on Sundays as my daddy always took boiler firing duty that day. He would take us to church – until we were old enough to walk there – and after our naps or chores we would come to the greenhouses. He would make treasure hunts for us…sending us to faucet handles or window wheels that opened the windows in the peaks of the greenhouse or other obvious places…and at the end of the treasure hunt was usually a nickel for a prize. 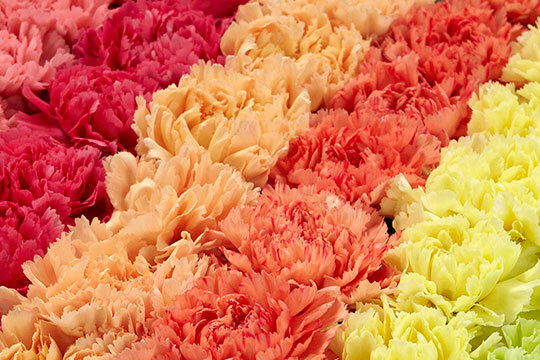 In our later years we earned money by doing transplanting or stringing carnations & chrysanthemums. What was the first thing you learned to design? When I started working at the downtown store at age 8, my grandmother taught me how to ring the huge brass cash register, how to write orders, make change, and wrap hand bouquets or individual flowers. Later, the manager of the store, who was a single woman (who worked for Greens for 46 years), taught me how to make corsages. Mima was adamant that I make a corsage every Saturday night for my date with Mel, and wear it to Church on Sunday. She taught me wiring, taping, bow making, assembly, packing…the whole nine yards. She had a sitting room in the back of the flower shop where all her lady friends would stop in for tea and cookies. She also did her own lunches and it was not uncommon for the flower shop to smell more like a restaurant than a flower shop. Which “chore” did you dread the most? The chore we hated most was stringing chrysanthemums. They were as tall as we were above the bench but we started when they were shorter. We had to wind the string around the stem clockwise and tie it to the wire high above the plant, so as it grew it would climb the string and have a strong, straight stem to hold it’s big head, 7-9 inches in diameter. If we strung the wire counter clock wise, and although it did not show up for several weeks, as the flower turned with the sun it would unwind and fall down. A whole bench of large mums on their sides was unacceptable! Believe Me! Did you always know you wanted to take over the flower business…or did you have other aspirations at one time? I always knew after Mel came that we wanted to take over the business. Mel had brought us into the 20th Century. He could do anything and my dad was an excellent teacher. He learned to do electrical, plumbing, heating, refrigeration, as well as floral design. He learned propagating, fumigating, harvesting, seeding, planting, benching, potting, you name it. He did not like hand firing the boilers, so dad and my uncle, who was in the greenhouse boiler business, and Mel put in the first stokers. Mel hired a refrigeration man and they built our first electric flower cooler. He eventually built a Garden Center Greenhouse on the highway in front of our greenhouse when my dad was away in England and could not protest. Mel later helped build our modern brick flower shop with wood church beam high ceilings. He did all the wood finishing, and the electrical wiring himself. Yes, we wanted to “Own It.” By this time my two sisters had been to college and married…the oldest, to a dentist, and the second to a welder. Both were making lots more money than even Dad and were not interested in our form of hard work. The greenhouses were lots of manual work. The benches in the greenhouses had to have all their dirt changed in the hot summer. The temperatures in the greenhouses would reach 130 degrees or more in the day. Then, in the late 1940’s, we started sterilizing the dirt in the benches with steam which meant the “Heat was On” in the dead of summer. As you went through the learning process…which flower designs did you love creating most and which ones did you find a bit difficult or unexciting? As I matured my favorite designing was corsage and wedding work. I learned from my mother and we wired and taped all our work. We also covered wires for the millions of bows we made for corsages, weddings, potted plants and sprays for funerals. I enjoyed wedding and corsage work, but never did care much about funeral work. Luckily, Dad, Mel and the others did the funeral work, although I did enjoy making and putting on the bows and cards, and putting pieces on easels. I did not like making the bases with the sphagnum moss as you could not always do it to suit them. The moss had to be put in the water, wrung out, then sorted to get twigs and hard pieces out and then fitted into the metal frames or into loaves for casket sprays and the loaves had to be wrapped in green waxed paper. The art of folding the wax paper was intricate so as not to get any of it too many layers so that the sharpened stems would slip into the moss and hold there. I did not care much about putting little wired picks on the ends of short flowers for inserting either. It was too much like factory work, too repetitive. Which mechanics technique frazzled your nerves the most? In wiring and taping Mima taught me to hold the wire in my right hand and the tape with the tape in my left hand and turn the wire with my right hand. This served me greatly for 60 years but when they started doing instruction manuals they taught everyone turn the wire with their left hand and hold the tape with their right. This is confusing especially when making corsages or wicking orchids. My dad taped like I do so he taught my how to wick orchids. He did not allow there ever to be a wire inserted in an orchid. He would make wicks of Kleenex and it had to be Kleenex brand. He would lay it on the table flat and sprinkle it with a spray bottle of water, then roll it a tight cord. He would make a hair pin of 22 wire about 4 inches long by bending it in half and then he would put a kink in the top curve. He would cut the orchid at a sharp slant and the end of the wick the same and put the wire hair pin snuggly around the top of the orchid stem right up under the throat of the orchid, He would then fit the two slants tightly together and using parafilm tape, (not floratape as floratape melts in water) he would wrap the stem and the wire down past the tight fit of the stem and the wick to the bottom of the wire and then tape back up again. Then he cut the wick off and inserted the stem into a water tube. The other design technique I still struggle to teach is inserting the flower into flower foam deeply. 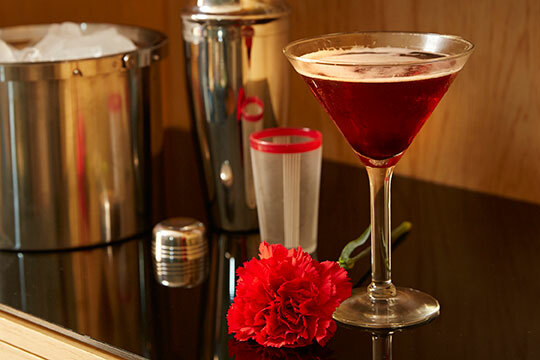 So many designers cut their flower stems too short and do not push the flower stem down into the flower foam so that when the water level drops in the vase the flower will still take up water. The water level in flower foam only reaches up about an inch and a half above the water level. So, if the stem does not go into the foam more than 2 inches…it won’t get any more additional water unless the recipient keeps the container way full and that “ain’t gonna” happen! Which aspect of the shop had the most appeal to you…the actual designing of the flowers, managing, landscape/garden plants or working with the customers themselves? 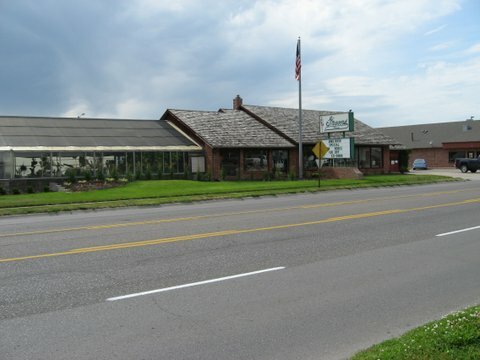 After we built the modern Flower Shop and Garden Center on the highway in front of the greenhouses, it was still my favorite to do wedding and corsage work and also prom work and wedding servicing. I loved working with Brides and their mothers and teens for proms. I especially loved servicing weddings and seeing to it all went well on their special day. My most favorite was fluffing the brides train just before she swept down the aisle on her beaming father’s arm. The growing operation fascinated me as the greenhouses would spring to life with Easter Lilies in the spring, geraniums and garden plants in the summer, and beautiful cut & potted mums, azaleas, and poinsettias in the winter. I needed to walk through the greenhouses on my way to work every day of my life for over 60 years and it was pure delight. There is not a fragrance like the smell of a greenhouse, as the heat in the pipes makes a moist steam in the air and the fragrances mix to produce a smell that is indescribable and unforgettable. It gets in your blood and you never want to leave it. It smells to me like the Garden of Eden. Procuring plants for the garden center was our favorite in our later years, when the greenhouses had been torn down. Going to the larger greenhouse growers to get plants for the garden center has always been one of my favorite long time challenges. Greens Florist & Greenhouse TODAY! 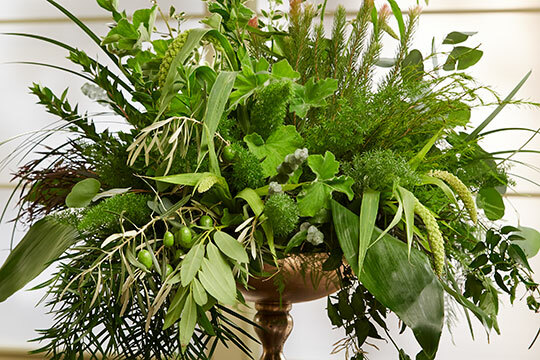 Other than family, which designer or flower design educator influenced you most? Too many floral Educators influenced our lives to single out any special one. My favorite commentator was Tommy Bright…and J and I were both recipients of the National Tommy Bright Communicators Award which is a life time achievement award for floral commentating. We are the only 2 generation winners of that award. Haskell Ergle, Matt Woods, Rene Van Remes, Art Ito, and Phil Rulloda all made big impressions on our designers as well as Mel and I. 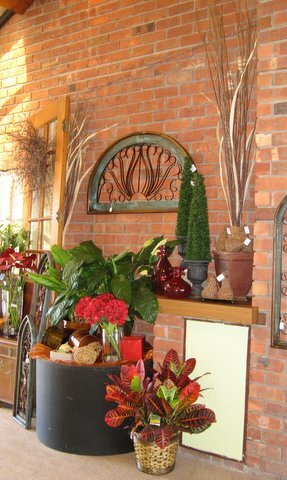 Our favorite Industry growers were Paul Ecke for Poinsettias, JimVosters for Green Plants in Florida, Oregon Roses in Oregon, Bushe Roses in Minnesota, The De Jongs in Pella, Iowa for Poinsettias & Lillies and Green & Garden center plants after we quit growing them. There was a handy greenhouse in Omaha, the Fergusons, we bought from for years for Spring garden plants after our greenhouses came down. When did you finally get handed the reigns of the family business? Mel & Joey Today…still going Strong! What was the FIRST thing you did when you took over? The first thing we did was close on Sundays. 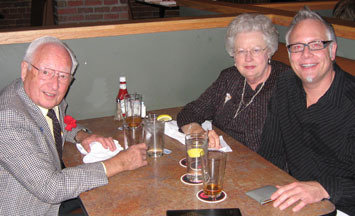 Mel had graduated from Lutheran school in 1939 and his faith was strong and he felt he needed to go to church every Sunday. After all, the Lord had brought him safely home from the war and he had a lot to be thankful for. What are the TOP 2 or 3 most important things that you learned about the flower business during your time in the industry? There is something about florists; I think it may be because we are chosen by God to work with one of his most precious gifts…. Flowers. There is so much that goes into raising flowers, the care and handling of them. You know the moment you cut a flower off it’s growing stem it begins to die. We need to be knowledgeable in cut flower care to make it last as long as possible. We have learned so much thanks to the many educators like George Staby that taught us so much and companies like Oasis and Floralife who invented all sorts of formulas to make flowers last. Varieties of flowers are bred so that they last longer. Billboard: Greens…serving the community for 110 years! Secondly, I am completely amazed at the broad spectrum of Talent in our Industry. The designers that you meet and watch create something different every time. They are a delight when they design, their ideas are seemingly endless. They have new expanding horizons for we novices to explore. They blend colors and textures, and all the elements of design. They are truly artists and are not daunted by the fact that most of their designs are only for the present. Perhaps they are inspired by the fact that God delivers the most amazing clouds, and sunsets, and snows…and all kinds of beauty that lasts but a short time. I learned in the flower industry to appreciate color and the color wheel…and the process of matching colors and décor…and needing the knowledge of color in homes and places that need flowers. Color effects mood, from pure delight to some signs of depression. I also cherish the awesome affect flowers have on people who receive them…the simple act of a single flower can brighten a day, and that act of sharing is a moment of joy to behold. People who buy flowers are precious and loving usually, they are giving a bit of themselves with the flowers. 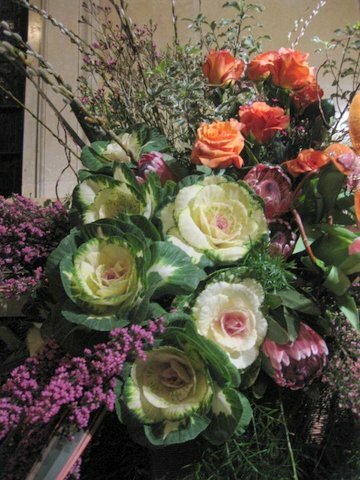 It is a treasure, unparalleled, to be able to work with flowers and the people who buy them. What were your top sellers? What were our top sellers? Well, we were four distinct parts in business for all those years. There were the greenhouses and the garden center, then there was the Flower Shop and the Treasure House. 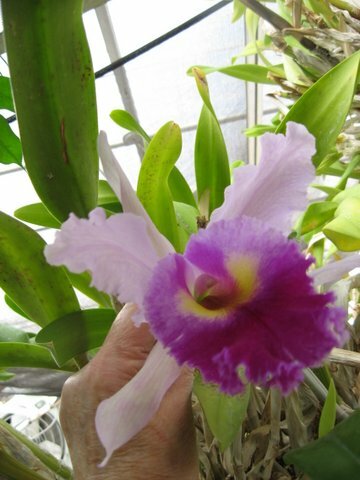 In the greenhouses, which at first were cut flowers, then came plants. So, in addition, we grew fantastic seasonal crops of Poinsettias, Easter Lillies, Azaleas,Chrysanthemums, Cyclamen and Violets. In the Spring came myriads of bedding & vegetable plants for the Garden center. In the Flower shop we offered: cash and carry specials, all the latest sympathy flowers, wedding and prom flowers, and fabulous roses, freesia, gerberas, mums, pompons, stock, snapdragons, calla lilies, etc. 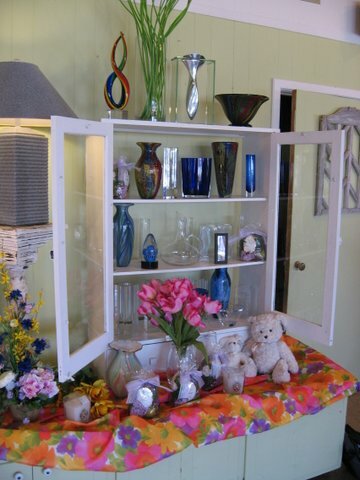 The Treasure House was known for outstanding candles, lamps, vases, teas, a paper line of stationary, soaps, lotions, cards of all kinds, and we have always carried “Aromatic” a real flower potpourri that is popular to this day. A special candle line out of Kansas City is still a staple for us. What were the most important characteristics you looked for when hiring an employee? When hiring an employee we looked for someone who was comfortable at all things. We let them know they would need to… wait on customers, answer the telephone, take orders, write legibly, and above all we hoped they would be a person who had some kind of talent. Either they could play an instrument, knit, crochet, sew, or art work. If it were a man, we looked for someone who did wood working, operated machinery previously…always a person who had learned to do something with their hands. If it were a person would say, “Oh, I have a hard time learning to do intricate work,” the answer was, NO. Name some of the essential “Schwanke Rules” for running a successful florist business. We always taught new employees to not say, ”May I help you?” That was taboo at Greens. We would have them say, “Is there something special for you today?” For one thing, you can not say that without a smile on your face. If they said, “Oh, I just wanted to pay a bill,” then we would say, “Well, that is special for us!” It was a good way to find out why they were here. In phone answering we insisted on having a smile on your face and say something like, “Greens Florist, Joey Speaking,” always giving your name so that they knew who they were talking to and follow it with…“Is there something special for you today?” Never “can I help you.” We insisted the telephone never ring more than twice and that the minute the door bell sounded one of us started toward the door to greet. If someone just wanted to look, we would check back with them in a few minutes after they had looked around a bit. We would then take the opportunity to ask, “What type of occasion are you looking for, perhaps I can make a suggestion” and do so. That is how you sell. The old SOS or “sell somebody something” was a motto. We suggested fancy greeting cards, an added balloon, or a stuffed animal when the occasion was appropriate. Although you are technically “retired,” you have still been active in the industry. Even though we are retired, we go into the shop every day. Our middle daughter still works there, we still get our mail there, and on Saturdays my husband is still the only delivery person. They are only open till 1:00 p.m. so it is really only a three hour job but it keeps us sharp. Mel still delights in greeting people when he is at the door with beautiful flowers. It makes his day. He always dresses with a golfer green “masters” sportcoat, a yellow shirt, a tie, and pocket hanky to match my dress of the day, and a bright red, fresh carnation boutonnière. Frequently the folks say, “Oh, thank you Mr. Green,” and he just beams. I am sure my daddy “Carnation Joe” Green and his ever present wife, Lily, smile down on us and remember when it was their job to deliver out of town and country deliveries in their day. Mel & Joey in one of their “Famous Matching” Outfits! 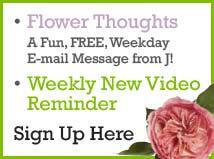 What are some of the biggest changes in the flower industry in general that you have witnessed through the years? 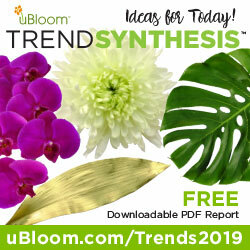 The biggest thing that changed was the start of grocery stores carrying fresh flowers and house plants, and the Big Box stores getting into the spring bedding plant business. Before that Florists had peaks and valleys in the year’s business and the peaks carried the valleys. Now, all these other types of businesses use our product for a loss leader and there are no longer big peaks for us. The competitors have so many more bucks for advertising, stay open all hours, weekends and Sundays…and it makes it very hard for the professional florist to compete with that. The fact that large chains can also offer so many benefits makes us lose our trained personnel to them. What was “Green’s” signature design? For our high schoolers and college trade we have always had theme arrangements for class musicals and plays, and our prom and school dance ideas are awesome. We have always kept up with trend setting, fashion styles, and paid special attention to the new color trends and styles. We had pictures, samples, and coolers full of all types of flowers, and we are trend setters in that part of our business. 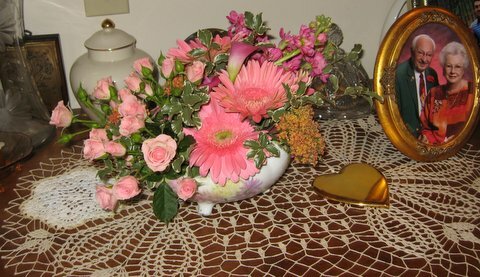 You have created thousands of flower arrangements in your lifetime. Name a few of the ones that stand out in your mind. The arrangements that we made that stand out in my mind are the endless array of designs on easels fashioned on wire moss filled wire frames. The “Gates A Jar,” “The Broken Wheel,” “The Faith Hope and Charity,” the Masonic Emblems, the easel sprays, and the wreaths with countless types of texture and color. Next would be the fabulous Casket Sprays and the Lid Adornments, like Satin Hearts, Crosses, Pillows, with “Great Grandpa” or such lettering. Speaking of lettering…You know how they spell Grandma, Wife, Husband, etc. in gold letters now? Well, for most of my life my dad, and then my husband, would write those designations in Chenille. What ever anyone wanted, we had boxes that the fellows premade of Mother, Aunt, Beloved, Husband, Son, Sister, Brother, Brother in law, all sort of colors too. They were stored in divided boxes in the basement so that they did not run out of something when we were out on delivery. My sister Alyce became quite good at doing it. She was the youngest and now that there are new generations they don’t use it anymore. The designs that always ‘stand out’ for Mel and I start with the Phil Rulloda techniques of braiding palms and foliages, and the clean lines and accents of tropical flowers he uses along with the striking color combinations he blends. So many of our Nebraska designers have taken classes with Phil that, when we have contests or flower shows, it really showcases the “Phil Rulloda School of Design” talent. 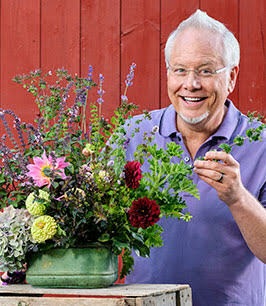 Both Phil and his wife Cathy, have made a big impact on floral design here in the Midwest particularly. Can you drop a few names of the more “famous” individuals that you have designed flowers for? We probably have not designed for too many famous people, but we have been with floral designers in lots of famous situations. Our ‘Congressional Action Days’ (when florists from every state in the nation go to Washington) with the Society of American Florists to make the Senators and Congressmen aware of our concerns with government policies concerning the floral industry. We would always have a large reception at the Caucus Room and designers would make floral arrangements for the attendees and their spouses and office Managers. It was always the best attended reception on “the Hill.” The room would be decorated magnificently and 8 or 10 designers would work the whole time during the reception. We also had a presentation for the President of the United States in the Gold Room of the White House several times, giving us hands on visits with Presidential first ladies Rosalyn Carter, Barbara Bush, and Nancy Reagan. In addition we met in our presidential suite in Denver with President Gerald Ford. This all had “to do” with fabulous flower arranging and the floral Industry. What did/do you love most about designing with fresh flowers? What did/do we like most about designing with fresh flowers? Fresh Flowers are a gift from God. He gave flowers to the universe as one of His most precious gifts. The story of flowers springing to life from a tiny, dried up looking seed, bulb, or crome, buried in the earth for a time and then it springs to life in a form never before seen in nature. A flower is truly a work of art, from the tiny pollen tips to the petals, the protective leaves, and even the tiny thorns. The flower starts to die immediately after it is picked and it is up to we florists to do our best to make it last as long as possible, but it is meant to be the story of life. We are born, we blossom and grow and mature and continue to bloom until then, slowly, we start to fade away… But, there is still much to be learned about that journey and that is why we liked to make flowers for funerals…to tell some of the story of the person they were in memory of. Funeral flowers are not for the dead person but are there to give comfort and memories to the ones left here on earth. It is a privilege, after all, to be a florist. The vocation that God chose for my family and my husband is one of the most rewarding & satisfying occupation on earth. True, it is hard work, but the wonders never cease…the creation of a flower, all the nurturing steps, the blessings they bring is the reward. Every moment of planning, the weeks of sowing, the hours of weeding, the days of watering, and the minutes of back ache it takes to produce a flower, is worth every second because of the satisfaction we receive. 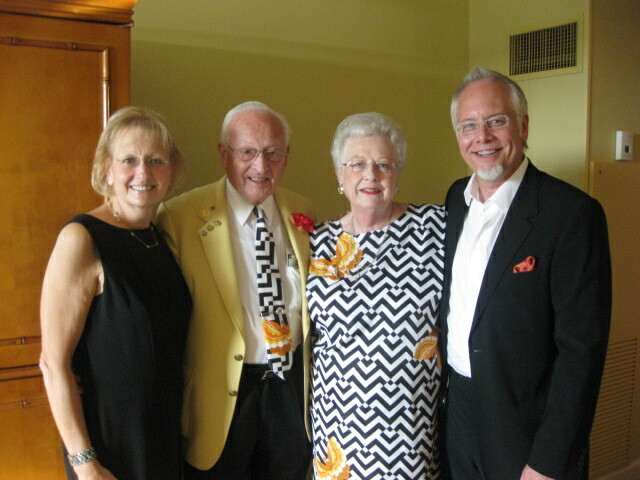 Flowers are a Family Affair…3rd generation florists, Mel & Joey Schwanke…4th generation florist, J Schwanke! Mel, Joey and J…These are wonderful stories! Your lives have been truly blessed with the world of flowers. Working with fresh flowers surrounding you each and every day, makes the horrifically hard work that goes with the floral industry, just fade. I find I remember the beauty surrounding me, rather than some pain, or being ridiculously worn to a frazzle! Thank you for this impressive story, and for your wonderful contribution to flowers!